The Newsweek article also led me to two new blogs about the intersection of books and technology: if:book, a project of the Institute for the Future of the Book, based right here in Brooklyn; and Teleread, "News & views on e-books, libraries, publishing and related topics". Now I've got lots more perspectives on this revolution/evolution/intersection/ flash-in-the-pan, or whatever it is, to absorb and use to create my own opinion. Not bad. 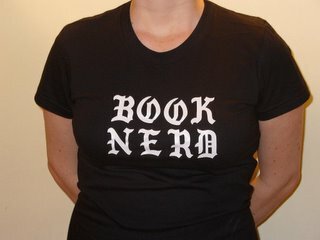 What do you think, intelligent and bookish readers? Have you thoughts on whether the Kindle will indeed make e-books viable, and if so what that means? I would love to interact with you in this digital forum. Or if you'd prefer to engage in real-life conversation, I'll be talking to customers at the bookstore later today -- you could drop by. Update: Before you make a decision, I recommend perusing the E-Book Report, a column for Publishers Weekly by the editor/publisher of Teleread. He calls the Newsweek article a "puff piece" and points out several major problems with the Kindle that will probably be familiar to those following the e-book saga.